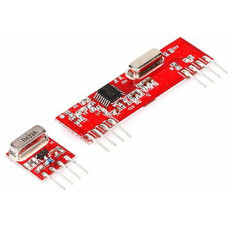 This hybrid RF Transceiver Module provides a complete RF transmitter and receiver module solution which can be used to transmit data at up to 3KHz from any standard CMOS/TTL source. The transmitter module is very simple to operate and offers low current consumption (typical. 11mA). Data can be supplied directly from a microprocessor or encoding device, thus keeping the component count down and ensuring a low hardware cost. The RX – ASK is an ASK Hybrid receiver module. The RF Transmitter Receiver Module is an effective low-cost solution for using 433 MHz. The TX-ASK is an ASK hybrid transmitter module. TX-ASK is designed by the saw resonator, with an effective low cost, small size and simple to use for designing.